Has the Philippines Forgotten its South China Sea Strategy? Manila is investing too much in its legal approach at its own expense. This was not always so. After more than 15 years, the Philippines has finally decided to repair its ragtag outpost on the Second Thomas Shoal, located about 100 nautical miles away from the Philippines’ westernmost province of Palawan. The Sierra Madre ship – a 100-meter-long tank landing vessel, operated by the U.S. Navy back in the Second World War – has served as a tenuous expression of Manila’s sovereignty claim over the contested feature in the South China Sea. For long, it has also served as an embarrassing reminder of how little the Philippines has invested in concretely defending its claims in a heavily-contested area. To paraphrase a Western journalist who visited the site in recent years, the Philippine outpost from afar is an abominable site amid a beautiful maritime wilderness; surrounded by reefs and a vast blue ocean, Sierra Madre looks even more awful up close. 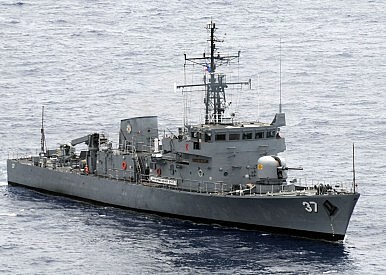 Since 1999, the rusty, grounded vessel has hosted – on a rotational basis – a handful of marooned and resilient troops, who have repeatedly resisted siege and other forms of intimidation tactics deployed by the far better equipped Chinese coast guard forces, which sometimes are even better armed than the Philippine Navy. Meanwhile, under the Aquino administration, the Philippines has heavily invested in its legal strategy against China, initiating a costly arbitration procedure to address the South China Sea disputes. On the ground, China has been rapidly consolidating its grip on a whole host of contested features, building a sprawling network of military and civilian bases, and creating the skeleton of an Air Defense Identification Zone (ADIZ). In many ways, the Philippines South China Sea strategy seems to be driven by an army of lawyers rather than tangible defense of its fortifications on the ground. Throughout the Cold War, the Philippines was among the most assertive claimant states in the Spratly chain of Islands. Under the Marcos regime, the Southeast Asian country embarked on an ambitious strategy of building an airstrip on the Thitu Island (Pag-Asa). Astutely realizing the primarily Darwinian nature of the island disputes in the area, the Filipino leadership shunned legal consideration. For instance, it expressed reservations about subjecting Philippine territorial claims to international arbitration — in favor of militarily asserting its claim in the South China Sea. In many ways, the Philippines was a trailblazer country in terms of developing an optimal strategy to defend its claims in a Game of Thrones-like contest for ownership among half a dozen nations. Since 1994, when China forcibly wrested control of the Philippine-claimed Mischief Reef, Manila has been acutely aware of Beijing’s expansionist calculus. In an unequivocal demonstration of its strategic opportunism, China moved ahead with gobbling up the Philippine-claimed feature shortly after American military bases in the Philippines were closed down amid an explosion of nationalist euphoria. Clearly, China’s aggressive maneuver was a response to a power vacuum in the region, especially as the Philippines struggled to strike an independent course after almost a century of dependence on the United States. Aside from employing diplomacy, both bilaterally with China and under the aegis of the ASEAN, the Ramos administration (1992-1998) responded to the evolving security environment in the region by initiating a decades-long program to modernize the Armed Forces of the Philippines. The problem, however, was the glaring lack of follow through. Succeeding administrations neglected the Philippines’ fortifications on the ground, reverted to the old strategy of relying on the United States, and hoping against hope that diplomacy would be enough to contain China’s rising ambitions. Meanwhile, considerably poorer countries like Vietnam systematically consolidated and expanded their position across the Spratly chain of islands to check Chinese ambitions in the area. As the former Philippine National Security Adviser Roilo Golez told me, the Philippines’ South China Sea strategic planning “was dominated by internal defense officers who looked inward and ignored the China threat in spite of repeated warning.” No wonder, then, he said, that “nothing was achieved by way of minimum deterrence during the 1990s and the 2000s.” He lamented how military modernization funds were going to “minor items” that “were useless” for defending the country’s claims in the South China Sea. Chronic corruption and protracted domestic insurgencies haven’t helped either. Now contrast this with the Philippines legal strategy against China. Recently, the Southeast Asian country dispatched a large contingent – composed of top officials from all branches of the state – to the oral hearing at The Hague. After more than two years of hard work, giving birth to more than 7000 pages of data, supporting documents, and pleadings, it is not even clear whether the Arbitral Tribunal, formed under the aegis of the United Nations Convention on the Law of the Sea (UNCLOS), will decide to exercise jurisdiction on the South China Sea disputes. Moreover, even if the Tribunal exercises jurisdiction, not only does it lack a mechanism to enforce any unfavorable verdict against China; it doesn’t also have the mandate to directly adjudicate sovereignty-related disputes (Both Manila and Beijing have refused to subject their territorial claims to the International Court of Justice). Over the past year and half, as the snail’s pace arbitration procedures gained shape, China has reportedly reclaimed 810 hectares across the South China Sea, while expanding its patrols and conventional military exercises in the area. This is the real dispute that the Philippines should respond to, as the country’s leaders correctly foresaw back in the Cold War days. The author is an assistant professor in political science at De La Salle University, and a former policy adviser at the Philippine House of Representatives (2009-2015. He is the author of “Asia’s New Battlefield: US, China, and the Struggle for the Western Pacific” (London ,2015). Philippine officials renew their attack on China's alleged aggression in disputed waters.